A ceramic fiber log set is required to complete the look of the gas burner assembly. The logs within this set will be molded to fit the exact burner used in this model. A ceramic liner will enhance the interior appearance of the firebox by overlaying the matte black metal interior, giving the interior more realism and depth. An electric blower will circulate heat from the chassis of the fireplace to the room, increasing the speed that the room is warmed. A remote control or wall switch can be added to this unit to ease control and regulation of the fire. *Venting Requirements: This unit requires venting pipe with an inner diameter of 4 Inches. Please see the Venting Components section on this page for venting pipe that must be used with this unit. * Please Note: This item requires a Barrier Screen, 6-piece Ceramic Fiber Log Set, and a Liner. WARNING: Cancer and Reproductive Harm. For more information go to www.P65Warnings.ca.gov. The Empire DVCP42BP70N Tahoe Direct Vent Fireplace includes an energy-saving intermittent pilot that will light each time you use the fireplace, rather than staying lit continually. The clean face, tempered-glass front, and aged-brick interior of this timeless model will appeal to buyers who desire longevity of design and construction. A unique burner creates rich flame patterns so that users can enjoy a realistic looking fire. Ceramic-fiber logs (purchased separately), will increase this impression, while minimizing the cleanup that a real wood fire would demand. 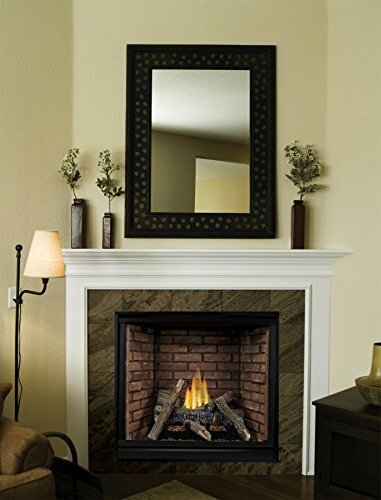 A protective screen should be in place any time a direct-vent fireplace is used to prevent heat injury.